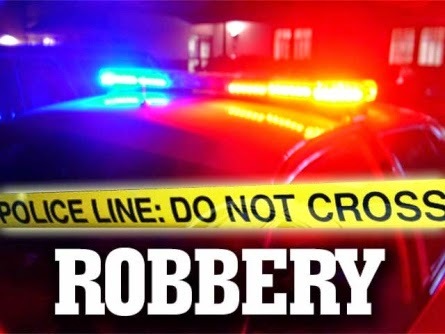 On February 5, 2015 at approximately 6:40 pm an armed robbery occurred at the Valero Gas Station located at 261 West White Horse Pike in the Pomona section of Galloway Twp. During the incident two white males approached the station attendant, one of the males grabbed the attendant while the other male took money out of his pocket. The attendant reported that both subjects were armed with knives during the incident. Following the robbery, the suspects fled the gas station on foot towards Rosemarie Avenue. Suspect #1-Stocky white male, wearing a gray, white and black hooded sweatshirt and jeans. His face was covered with a bandana. Suspect #2- Slim white male wearing a blue or black hooded sweatshirt with and unknown type of monogramming on his chest, jeans and a bandana covering his face. Anyone with any information on this incident can call Detective Kerry Baerman of the Galloway Township Police Department at (609) 652-3705 ext. 320.